Commencement is less than 24 hours away! We can barely wait to celebrate this special evening with the Rio Class of 2014. 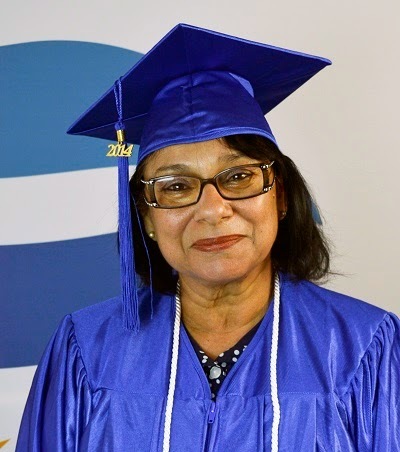 We’re also eager to share that special moment when Virginia Lee Contreras walks on stage to receive her Associate Degree in Early Childhood Education and Human Development. She got married, started a family and worked for a living. Later, as a single mother, she devoted her time to her two children, but still managed a college class here and there. Virginia met with Rene Manning from Rio Salado College’s Early Childhood Education department, who helped her get on track to pursue and complete an Associate of Arts in Early Childhood Education. When Virginia graduates on May 6, 2014, her lifelong goal will be realized. Contreras has had a lifetime of experience in the field of early childhood education and currently works for the Maricopa County Head Start program. Her next step is to pursue a bachelor’s degree and continue serving as a role model for her son who is also a returning student. We encourage Rio graduates to follow Virginia's lead and share their personal stories-- to help inspire others who may think education is out of their reach.